Props to Ridley Scott, who at the ripe old age of 80 is still one of the fastest, most reliable directors around. Earlier this year he delivered on his latest Alien film, and jumped immediately into the potential Oscar-contending drama, All the Money in the World. 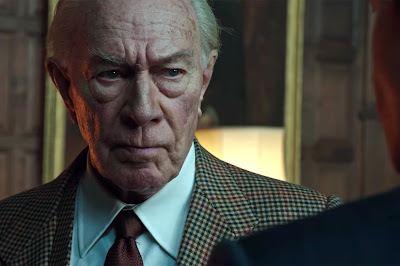 Up until about a month ago we were expecting the kidnapping film to feature Kevin Spacey, but after allegations of sexual misconduct arose, Scott leapt back into action like a filmmaker half his age, erased the former Lex Luthor from every scene in the film (except one), replaced him with screen legend Christopher Plummer (his original choice for the role) and re-edited it in time for the awards season. In practical terms, the move probably doesn't have much of a noticeable impact except we don't have to endure Spacey in atrocious, heavy age makeup. The role of billionaire oil tycoon John Paul Getty is small but pivotal, and ultimately the reason why All the Money in the World doesn't work as well as it could. And that would have been the case no matter who was playing him. The film is based on the real-life events behind the kidnapping of Getty's grandson, John Paul Getty III (Charlie Plummer), and his steadfast refusal to pay a single penny to save him. I'm paraphrasing, but there's a quote that basically says "If family isn't there to help, then what are you keeping them around for?" In the case of Getty Sr., family are little more than assets to be acquired and dropped depending on their immediate value. Moments after his grandson is taken right off Rome's darkened streets by van full of organized criminals, the boy's mother Gail (Michelle Williams) makes an impassioned phone call to the Getty palatial estate asking for help. But she is, rather comically, refused by Getty who is busy looking at stock trades roll in on the ticker. Instead, Getty allows for one of his top aides, a former CIA spy Fletcher Chase (Mark Wahlberg), to keep Gail in line while negotiating the cheapest way possible to free Getty III. And by "cheapest way possible" that means "free." No money will be made available. It's ludicrous, right? While based on true events the actions taken by Getty are simply too unbelievable, especially as he's seen spending money like a fiend on one expensive trinket after another. We're only able to understand the depth of his fiscal madness through flashback, which shows him to be a ruthless business who doesn't like being beaten on any deal, and Gail, in her efforts to divorce from Getty's drug-addict son, got one over on him. What she won isn't what you think, but to Getty it didn't matter. Balancing the books is all that matters. Plummer's performance as Getty has already earned him a Golden Globe nomination, so in that regard Scott's risky maneuver has paid off. I feel pretty sure that Spacey's version had a bit more smarm to it, while Plummer's is more like Grandpa Simpson telling the onion belt story on an endless loop. We're disgusted by Getty, but we're also too busy laughing to hate him, and that causes real problems as David Scarpa's screenplay tries to get across how serious Getty III's predicament is. Even as he's sold off to a more brutal crime family willing to literally "cut" their losses, Getty III never seems like he's in any real danger, and even has a guardian angel among the kidnappers (played by Romain Duris) who does his best to look after the boy. I expected more outrage and histrionics from Williams' performance as the frustrated Gail, who both despises and needs the Getty fortune if her son is to survive. But Williams keeps it on simmer for the most part, with a couple of small outbursts. It's a smart move because Plummer is loopy enough as is, and she works well opposite Wahlberg who also plays it cool. Working for the second time this year with DP Dariusz Wolski, Scott captures the beauty and inherent danger of Italy when one looks past all of the old relics and crumbling buildings, with some shots comparing favorably to the great recent Italian crime film, Gomorrah. In a matter of weeks Danny Boyle will tell his own take on the Getty kidnapping in the FX series, Trust. Another reason for Scott to speed All the Money in the World into reality despite all of the hurdles. It's a solidly successful crime film that shows Scott's remarkable professionalism and willingness to move mountains to do what was ultimately the right thing in removing Spacey. When all is said and done, the film may be best remembered for what it almost was rather than what it actually is.